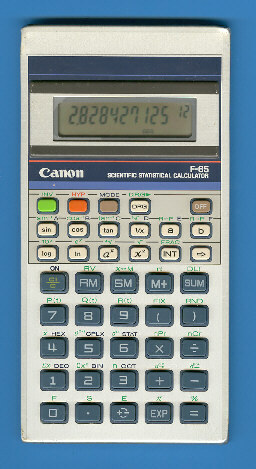 The Canon F-65 Scientific Statistical Calculator adds some features to its sibbling F-58 but sports the same housing and keyboard. If we run the Calculator Forensics of the F-65 we discover the same 12-digit precision found on the TI-35 PLUS and TI-52. Dismantling the F-65 reveals indeed with the Toshiba T7767S single-chip calculator circuit a well known product. The internal construction of the F-65, based on the LX-40 calculator, is very sophisticated. Just a small, one-sided printed circuit board (PCB) attached to the LC-display, batteries and the keyboard. The keyboard itself uses a sandwich of two conductive foils with an isolating spacer between them. The sheet metal supports the connections of the PCB to the LC-display and the keyboard.